Our experience has shown that candidates who spend the time preparing well for their interviews, consistently outperform those who don’t prepare – even if they are potentially a stronger match on paper! Preparation for an interview is critical. Nobody is so experienced that they don’t require significant preparation for each interview they attend. Preparation for interview is not a quick flip through the potential employer’s website and job specification! Feel free to bring notes including any specific questions you need answered – this sort of preparation will be seen as an indicator of a strong potential hire for the employer. Critical to your preparation is understanding or predicting the needs of your audience. Can you do the job? Do you have the necessary skills, qualifications and experience? What is your motivation for doing the job? What is your attitude to work like and what are your career goals? Will you fit into the team? Is there a culture match? Will you be someone they will enjoy working with? Are you someone that presents as a ‘risk’ to the harmony of their current team? If you are prepared to answer these questions for the client at interview, and are able to do it in a structured manner with relevant examples, you are heading towards becoming the employee of choice. Who is your audience? What is their role? Where do they fit into the organisation? What are their professional backgrounds? What they are looking for? What are their expectations for the role? Why does the organisation need the role? What is the context surrounding the vacancy? Remember, Canberra is a small city and a ‘who you know’ town. Find out more about your new potential employer and interviewers by calling and speaking with those most likely to be in the know. Remember the degrees of separation in Canberra are minimal and it won’t take many calls before you are much better informed. Don’t be afraid to ask for a personal referral from your ‘connection’. If used wisely a personal referral or recommendation can be a huge advantage at interview, however, if you are in doubt whether the referral connection is a sound one we recommend caution. At HorizonOne we pride ourselves on having in-depth knowledge of our client’s organisations and work cultures, often built over many years. Make sure you make the most out of this information by preparing for and questioning your consultant in detail prior to interview. If they don’t have the information you need they are likely to know how to get it. Know your ‘story’ inside and out. Think through your experience and be able to articulate how you have come to this point in a manner that is positive and logical. It sounds counter-intuitive, but knowing your work experience intimately is key to your success at interview. Rarely does everyone remember their past work experiences off by heart, and even more rarely are they able to describe these experienced with a structured, logical manner. In Canberra we are blessed with a huge amount of information online about local organisations particularly public sector organisations. Organisation websites, media releases, annual reports, published business plans…….Google is your best friend when it comes to preparing for interviews. Take advantage of this plethora of information so you are able to go into your interview with eyes open. But remember, the web is only one source of information – it is dangerous to rely solely on the internet for interview preparation. Study the job duties and prepare questions about aspects of the role that are not clear to you. Be 100% sure of the time, date and location of the interview and research travel times, public transport or parking well in advance. Always make sure you come to the interview ‘armed’ with all relevant contact details ‘just in case’. This includes who will be there, their positions in the organisation, their phone numbers etc. Any more than ten minutes early is too early – if you arrive too early wait in the car or take a short walk to calm yourself. Anything later than the agreed interview time can be an indelible black mark against your chances at interview. There are a wide range of commonly asked interview questions that when prepared for, can allow you to concentrate on more difficult questions or on building rapport with the interviewers. Remember, just because the questions are common and ‘about you’ it does not mean they will be easy to answer so preparation is vital. And again, don’t forget to exemplify your responses! Although this seems a simple question, many people find this one very difficult to respond to appropriately. To get the most out of the situation you need to prepare a response as it is easy to get carried away and present a lot of irrelevant personal information or to ramble. Your answer to this question needs to be specifically targeted to the job, selection criteria and the organisation. There are many different ways interviewers seek to access your interpretation of your strengths and weaknesses. How would your referees describe you? What achievements define your career to date? What will you bring to our organisation? What specific skills are you most proud of? Remember to focus on providing a mix of personal and technical strengths – we recommend preparing a minimum of five overall with detailed examples to support your statements. Avoid self-qualifying statements. If it is a strength explain why referring to previous examples of how this strength has led to positive performance outcomes benefiting previous employers. What weaknesses are there in your performance to date? Where do you feel you could improve your performance? In your last performance review what were the key areas for development raised? When describing weaknesses it is best to give only one or two examples. Describe your weakness as point for development you have identified, perhaps with the help of a previous manager, and describe constructively how you seek to address this. The interviewers are keen to see you demonstrate self-awareness and emotional maturity/intelligence. Honesty is always the best policy but make sure you frame your response in a positive or constructive light. Remind them that when you identify a problem, you actively take actions to correct it, and that is how you do things. What are your long and short term goals? What motivates and interests you? Why are you interested in this job? Why are you suitable for it? What do you know about our organisation/team? Make sure you are prepared for these standard questions as a minimum. The theory behind these kinds of questions is that your past performance is the best predictor of future achievements. These types of questions require you to give specific examples of work situations to illustrate your previous performance or behaviour. They are meant to be tough to answer, and require significant preparation to answer them well. Tell me about a time when..? Can you give me an example of when you have…..? Following the initial prompting question they are often followed up with guided prompts to steer you towards providing an answer that meets the requirements. What were the consequences? What was the result? This style of interview questioning can be used to assess any of the core competencies required for a particular position. Tell me about a time you had conflicting priorities to deal with? How did you manage this? What was the result? This should be a no-brainer, but we are constantly receiving feedback from interviews where candidate’s appearance has led to negative impressions and then outcomes. Do not come with sleeves rolled up, tie, fly or top button undone! Make sure your mobile phone is switched off!!! Greet each interviewer with a firm, full hand handshake and make sure you keep good eye contact. Keep the interaction as genuine as possible and seek to establish rapport early – the first five minutes are vital! Avoid the appearance of your greeting being a rehearsed routine. Be aware of your posture and body language during the interview – non-verbal cues are critical to interviewer impressions. Keep your body language positive and/or neutral, sitting upright in your chair with hands relaxed. Practice your interview responses answers and consider running a ‘mock interview’ with a friend or colleague just as you would when preparing a presentation or similar. There is endless material available online or otherwise about using the STAR technique to answer interview questions. If you are not aware of this approach for answering detailed interview questions, it is GUARANTEED to impress at interview. Situation – Set the context by describing the circumstance where you gained the experience. Task – What was your role in addressing the requirement/problem? Action – What specific action did you take? How did you do it and how did you make the outcome a positive one? Result – What did you achieve? How was it measured? What was the feedback? How does it relate to the role you are applying for? Don’t “oversell” yourself or embellish the truth. Don’t complain about criticise former employers or managers – be VERY careful here. Don’t over-answer questions. Keep answers informative but relatively brief. Monitoring your interviewer’s body language will give you clues as to whether you are talking too much. Don’t ask about every fine detail of personal benefits offered by an employer, it will leave you looking like a needy or difficult employee– wait until an offer is looking likely before you head down this road. Don’t provide in sufficient detail in answers demonstrating your experience or abilities. Prepare for inexperienced or nervous interviewers. Remember, many interviewers do not interview people regularly and many are not naturally very good at it. Many a time we have heard from candidates leaving interviews bewildered after fifteen minutes wondering what they did wrong! More often than not a short interview results from an inexperienced or unskilled interviewer rather than the candidate. By preparing questions and being able to volunteer structured information about your experience relevant to an opportunity you can help guide an interview with momentum to your advantage. Do not continue apologising throughout the meeting as this will create a lasting negative impression. If you are ill and you still attend your interview, let the interviewer(s) know in advance so they are aware. Generally, this one is better handled in a second interview or conversation once the employer has clearly identified interest in employing you. If you are held to providing an answer we recommend only answering if you have a full understanding of the requirements of the position and wherever possible indicating a salary range. Aim to leave a positive impression. 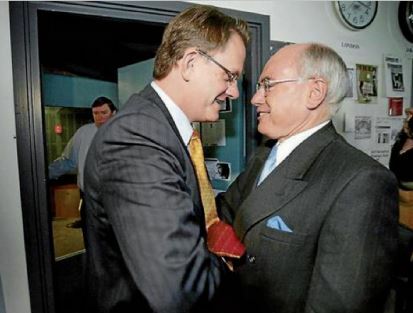 Don’t leave with a rehearsed routine, a fixed stare in the eyes with a jerky handshake (think the awkward handshake between Mark Latham and John Howard in 2004’s federal election campaign).